Facebook has launched its new video app Riff, which takes the formula from Vine and adds collaboration to it to create something fresh and unique. In Riff you can shoot a video of up to 20 seconds, give it a title, and instruct others on what they should add to it. Friends will get notifications and can add scenes, text, and more. Basically, it’s Vine combined with collaboration. “The potential pool of creative collaborators can grow exponentially from there, so a short video can become an inventive project between circles of friends you can share to Facebook, or anywhere on the Internet,” said product manager Josh Miller. Riff is the latest Facebook Creative Labs project to be released. Other graduates include Paper, Rooms, Groups, Slingshot, and Mentions. Riff is entering a competitive space, though, going up against the likes of SnapChat, JumpCam, Vyclone, and MixBit, among others. There are a couple of differences between Riff and its competitors. The first is the lack of multi-shot recording or editing features that are standard on Vine, Instagram, and other apps. Secondly, there’s no commenting; it’s all about collaboration. Most importantly, only the creator’s friends are allowed to add to the video. The idea here is that the video will spread socially as more people are allowed to contribute. 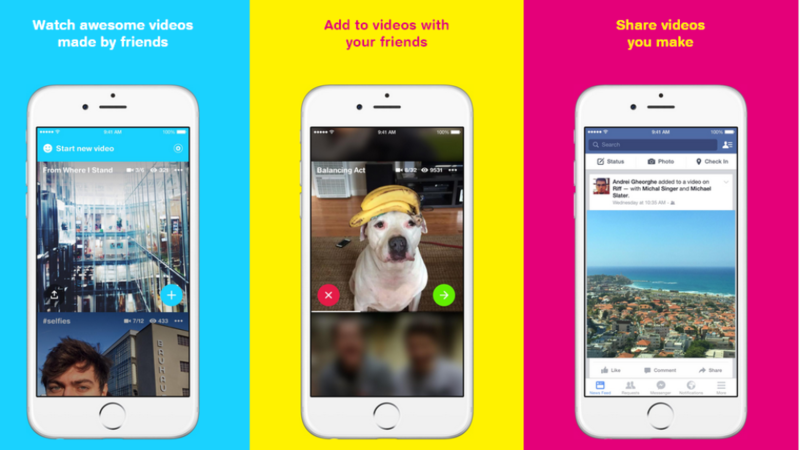 As far as I can see, Riff is an experiment in video from Facebook—an interesting one at that. Most Creative Labs projects don’t gain much traction. Even if Riff doesn’t become popular, it’ll still be an enlightening experience for Facebook. Rajiv Ashrafi is a tech geek from the backwaters of the world who also loves literature, heavy metal, and cats—not in any particular order. He is particularly passionate about innovative designs and exciting new ideas that push the boundaries for humanity. Besides that, you will find him ranting and rambling about the moral quandaries of biscuits, among other things.